The iconic sci-fi adventure Forbidden Planet is celebrating its 60th anniversary today. Featuring stunning visual effects for its day and the beloved genre icon Robby the Robot, the film followed the exploits of the C-57D, an earth ship sent to Altair 4 to find out what happened to a colony mission sent there 20 years earlier. Led by Commander John J. Adams (Leslie Nielsen), the team discovers that only Dr. Morbius (Walter Pidgeon) and his teenage daughter Altaira (Anne Francis) survived a deadly attack by an unknown entity. That strange being returns once the crew has arrived, and they fend off its invisible attacks while attempting to convince Dr. Morbius to share the amazing, mind-powered technology from the extinct Krell race that he has discovered on the planet. In honor of its anniversary, here are 15 fun facts about this legendary film. 1. FORBIDDEN PLANET WAS HOLLYWOOD'S FIRST TIME GOING COMPLETELY OUT OF THIS WORLD. While plenty of previous science fiction films had earthlings exploring other worlds, Forbidden Planet was the first film to be set entirely on a foreign planet. While there are plenty of outdoor sequences in the film, all of them were shot indoors on a studio soundstage, while many exterior landscape shots are comprised of colorful and detailed matte paintings. 2. THE SOUNDTRACK WAS GROUNDBREAKING. Forbidden Planet was the first movie to have an entirely electronic score; it was composed by Bebe and Louis Barron, who were pioneers in the field of electronic music and musique concrète. Their otherworldly sounds, both as atmospheric ambience and for special effects, imbued the film with an uneasy tension beyond the onscreen action and dialogue, especially during the tour of the Krell wonders underground. Mass audiences had not heard anything like it before. 3. THE SOUNDTRACK WAS ALSO CONTROVERSIAL. Because the Barrons did not belong to the Musicians Union, their original intended screen credit for Forbidden Planet, "Electronic Music by Louis and Bebe Barron," was changed to "Electronic Tonalities" thanks to a dispute with the American Federation of Musicians over union regulations. Sadly, their work on the film was then unable to be considered for an Oscar. The couple did go on to score independent films and Broadway musicals, so at least the fruits of their labor were rewarded in other ways. 4. ROBBY THE ROBOT WAS RELATED TO WASHING MACHINES. Robby's main designer and uncredited builder, Robert Kinoshita, distilled thousands of drawings conceived over five weeks by a team of five men into the iconic design that we know and love today. Prior to working in film, Kinoshita had designed washing machines, so while Robby had an anthropomorphic design in his upper regions, his chest and legs resembled a washing machine tub. No word on whether Robby does laundry, although he did appear in a dream sequence on an episode of Hazel as a maid. 5. ROBERT KINOSHITA DESIGNED ANOTHER ICONIC ROBOT. That electronic entity being, of course, The Robot from the '60s sci-fi series Lost In Space. While their design was somewhat different, the two cybernetic companions shared a similar "talk box," a display that lit up in tandem with the rhythm of their speech. Robby actually guest starred on three episodes of Lost In Space. 6. ROBBY GOT A SPIN-OFF MOVIE A YEAR LATER. 7. ROBBY RACKED UP A LOT OF OTHER CREDITS. 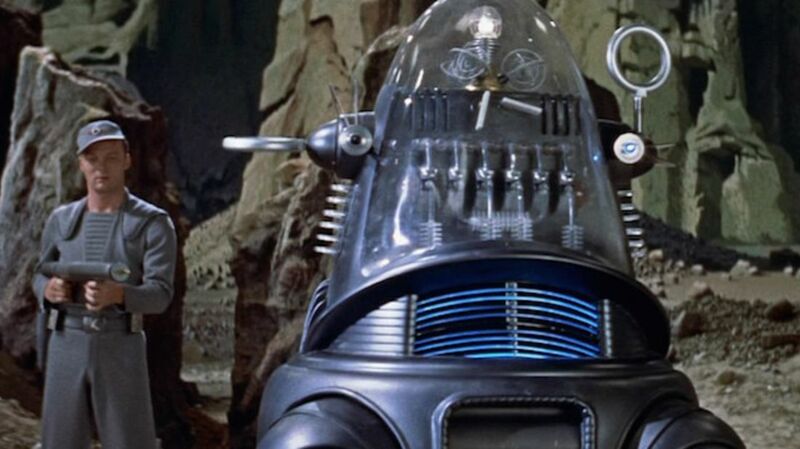 Forbidden Planet made its lovable bucket of bolts a star, and throughout his career Robby racked up more than two dozen film and TV credits, including The Invisible Boy, The Thin Man (TV series), Lost In Space, The Twilight Zone, Wonder Woman, Mork and Mindy, and Gremlins. He has also done TV spots for Charmin, AT&T, and General Electric (that last one in 2012). 8. SIGMUND FREUD WAS AN INSPIRATION FOR THE STORY. SPOILER ALERT for this fact: There is a reference to one third of Sigmund Freud's structural model of the psyche, the Id, the part of the unconscious mind that represents our primal needs and desires. In Forbidden Planet, the Id Monster that attacks the crew of the C-57D is conjured directly out of the subconscious mind of Dr. Morbius and generated by the mind-powered Krell technology that he studies and worships. 9. THE NARRATOR MENTORED CAPTAIN MARVEL. The film's opening narrator Les Tremayne appeared onscreen as the Mentor to Billy Batson/Captain Marvel in the 1970s TV show Shazam!, which was based on the DC Comics title of the same name. Billy and his Mentor traveled around the country to help people in need. All Billy had to do was say the magic word "Shazam!" to be transformed into the mighty Captain Marvel. 10. FORBIDDEN PLANET REFLECTED THE SEXISM OF THE TIME. When three of the crewmen meet Dr. Morbius' naive 19-year-old daughter Altaira for the first time, they all entertain thoughts of conquering her. Lt. Jerry Farman takes advantage of her innocence early by teaching her to kiss, for which he is chastised by Commander Adams, who later seduces her (after lecturing her on her skimpy wardrobe). Given the fact that these men are on an investigatory mission and are there to help any survivors of the original search party, this is rather exploitative. Yet Altaira's father does not seem concerned. 11. TWO FAMED '70S TV ACTORS MADE EARLY APPEARANCES IN THE MOVIE. The starship's communications offer was played by Richard Anderson, who would later become well known for his role as Oscar Goldman on The Six Million Dollar Man. One of the crewmen was an uncredited James Best, who later portrayed the bumbling Sheriff Rosco P. Coltrane on The Dukes Of Hazzard. 12. THERE'S A LOT OF FORBIDDEN PLANET MERCHANDISE. Like any iconic genre movie, Forbidden Planet has spawned its fair share of merch, including ship models and other model kits, lunchboxes, action figures, pins, and more. The title also inspired a chain of pop culture stores with locations in New York City and London. 13. THE FILM INFLUENCED SEVERAL ICONIC SCI-FI FRANCHISES. Forbidden Planet seems to have had some influence on Star Trek, particularly the transporter room effect that was likely inspired by the statis chambers used for light jumps in the film. Some viewers think a Borg cube resembles the movie's Krell underground cube structure, which is 20 miles long on each side. Further, the concept of a space crew going on an interplanetary mission was central to Star Trek. "Forbidden Planet could have been the pilot film for Star Trek," star Leslie Nielsen told the Houston Chronicle in 2006. "And maybe it was." The movie also inspired the four-part Doctor Who tale "Planet of Evil" from 1975, which was conceived by writer Louis Marks, producer Philip Hinchcliffe, and script editor Robert Holmes as a cross between Forbidden Planet and Dr. Jekyll & Mr. Hyde. In this story, the Doctor and Sarah visit the planet Zeta Minor, where only a professor of a geological expedition from the planet Morestra has survived the attack of an unseen entity. A Morestran military team also arrives to investigate. Finally, the tractor beam generator in Star Wars looks like part of the Krell machine network, while a hologram sequence is reminiscent of the message Princess Leia sends to Obi-Wan Kenobi via R2-D2. Star Wars sound designer Ben Burtt acknowledges even a subconscious influence of the atmospheric sounds within the Krell machinery on the hums and rumblings inside the Death Star. 14. DISNEY PLAYED A PART IN FORBIDDEN PLANET’S VISUAL EFFECTS. The special effects sequences in the film, notably the Id Monster attacking the crew, were designed by Joshua Meador, who was on loan from Disney for the project. Two years earlier, Meador was part of the Oscar-winning visual effects team for 20,000 Leagues Under The Sea that was also subcontracted from Disney by MGM. Meador oversaw effects for many major Disney animated features including Pinocchio, Fantasia, Dumbo, and Bambi. 15. THE FILMMAKERS WERE RECYCLERS. Forbidden Planet was shot on same stage as The Wizard of Oz, with bits of Munchkinland used for Altaira's garden. In an interesting twist, some of Forbidden Planet's costumes (including the crewmen uniforms and Altaira's clothing) were re-used in Queen of Outer Space, a 1958 sci-fi movie starring Zsa Zsa Gabor in which a space crew that has crash landed on Venus attempts to overthrow its female dictator, who has banished men from the planet.